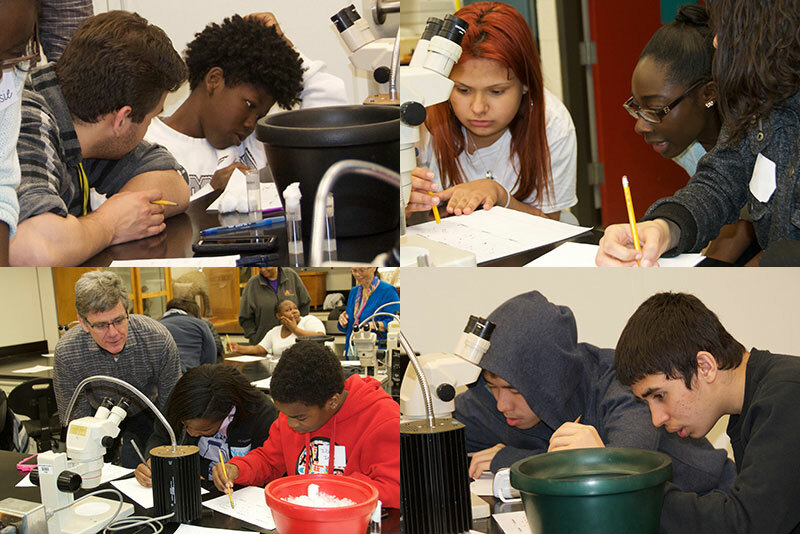 The Department of Biology launched our STEM outreach collaboration with East Upper School on April 26th with a visit by Mr. Cebrahil Gurler-Carrasquillo’s 9th grade living environment class. Cebrahil was a 2014 U of R graduate. The centerpiece of the visit was an evolutionary biology laboratory on cold adaptation among Drosophila species. The students discovered that flies that were adapted to cooler climates recovered from cold faster than those from warmer environments. An innovative aspect of the lab was a virtual fly collecting expedition using the spectacular Vista Collaboratory in Carlson Library. Using this curved 20 ft by 8 ft high-resolution video screen, the students navigated the globe by Google Earth. The students traveled to collecting sites in Iceland, France, and Africa, taking time off to visit tourist sites like the Eifel Tower and a soccer game at the Mandela National Stadium in Uganda. As we “took off” from Rochester International Airport one student reported feeling airsick! After the expedition the students entered the lab and assessed the cold tolerance of six fly species. The students stayed focused and exhibited great energy and determination. The visit was organized by David Goldfarb, Co-Chair of the biology department’s Community Outreach Committee, and was the culmination of many people’s voluntary efforts. Kristin Kelly, teaching lab manager, was responsible for preparing all aspects of the lab, including culturing the flies, setting up the microscopes and other equipment and tools. Our Chair, John Jaenike, gave an introductory lecture, and Bob Minckley, who is Mr. Cool to these students, directed the two-hour lab. Georgina Kessie, a U of R senior, served as TA. The Vista Collaboratory experience was coordinated by Brendan Mort, CIRT Director. After the lab the students enjoyed a pizza lunch in Wilson Commons and a tour of the campus by two Meridian Society guides, administrated by Kim Crosby in Admissions. Our efforts to enhance STEM education at East have been supported by Michael Occhino, Director of Science Education at the Warner School of Education. View the University's article about this here.